There is an “albino monster”That begs for attention and taunts herIt comes out day or nightGiving her such a frightThat now the “empty page” haunts her! Awaiting my fingers to begin.What will be its completed surprise? Painting images that dance in my head,Drawing them in orderly fashion,To give them substance and come alive,That’s my desire, that’s my passion. Coloring, shading, tinting here and there;There must be a point at which to start,To choose from the hues of my palette,And blend them into a work of art. Stirring scenes depicted by my touch,To express the feelings of my heart,Offered when troubles surround a soul,For its comfort I long to impart. Giving my fingers freedom to move,Yet sketching with a divine restraint,Guided by the Master Craftsman’s Hand,I click on the keys and start to paint. Obviously, it’s about writing also. But this post isn’t about writing. I used writing as an analogy. Just as any writer, artist, or composer uses a blank paper or canvas to display his or her work, so, too, do we. This post is about the blank page God gives us of each day. It is to be filled for His glory with all that we say, do, and think. His plan and purpose will fill each 24 hours in the best way possible…if we follow them. However, in all the daily hubbub of a busy schedule of running errands, working (and some working two jobs), appointments, emergencies, cleaning the house, or whatever, we get sidetracked and leave God out of our day. 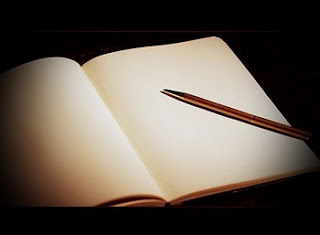 What are you writing on today’s blank page? Does it glorify God? Is it fireproof?